Really like this one and it isn't immature like some of their past tracks.<br><br>13th UK top 10. 21 weeks in the UK top 100. <br><br>UK#2.<br>Ireland#1 (1 week). <br>Scotland#1 (1 week).<br>Portugal#13.<br>Bulgaria#31.<br> <br>South Korea#45.<br><br>1 week US top 10. US#10.<br>Canada#13.<br><br>Brazil#67 of year end 2015.<br> <br>2 weeks top 10. 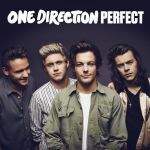 World Chart#3.<br><br>The biggest selling boyband single of 2016 in the US.<br><br>600,000 copies sold in the UK. Eigentlich ein ganz nett, schön dahin treibender Popsong, der sich soundmäßig/auch stimmlich gut anhört.<br><br>Zieht sich aber etwas, da die Struktur ein Spur zu simple ist. Der Mittelteil holt da auch nicht viel raus. 4* kann man schon geben. When I first heard this, I was horrified, and that opinion hasn't changed in the countless times I've heard it since. This is a very alarming regression for them after recently making probably their best song, "Drag Me Down".<br><br>It is a move back to the childish rubbish they were making a couple of albums ago, especially the first verse with all the "knight in shining amour" and "taking you home to mother" imagery.<br><br>Also, saying to someone "I'm perfect for you" just sounds wrong. But, of course, because it is the boys from One Direction saying it, it is the most romantic thing ever.<br><br>It also sounds very musically similar to Taylor Swift's "Style", one of the most boring and dull songs of the year, so that really isn't doing this song any favours either.